Not to be confused with Bureau of the Central Committee of the Russian Communist Party (bolsheviks). The Politburo (Russian: Политбюро, IPA: [pəlʲɪtbʲʊˈro], full: Political Bureau of the Central Committee of the Communist Party of the Soviet Union, abbreviated Политбюро ЦК КПСС, Politbyuro TsK KPSS) was the highest policy-making government authority under the Communist Party of the Soviet Union. It was founded in October 1917, and refounded in March 1919, at the 8th Congress of the Bolshevik Party. It was known as the Presidium from 1952 to 1966. The existence of the Politburo ended in 1991 with the breakup of the Soviet Union. 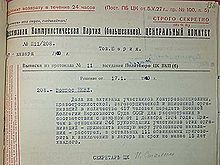 On August 18, 1917, the top Bolshevik leader, Vladimir Lenin, set up a political bureau – known first as Narrow composition and, after October 23, 1917, as Political bureau – specifically to direct the October Revolution, with only seven members (Lenin, Trotsky, Zinoviev, Kamenev, Stalin, Sokolnikov, and Bubnov), but this precursor did not outlast the event; the Central Committee continued with the political functions. However, due to practical reasons, usually fewer than half of the members attended the regular Central Committee meetings during this time, even though they decided all key questions. The 8th Congress of the 8th Party Congress in 1919 formalized this reality and re-established what would later on become the true center of political power in the Soviet Union. It ordered the Central Committee to appoint a five-member Politburo to decide on questions too urgent to await full Central Committee deliberation. The original members of the Politburo were Lenin, Leon Trotsky, Joseph Stalin, Lev Kamenev, and Nikolai Krestinsky. The Soviet system was based upon the system conceived by Vladimir Lenin, often referred to as Leninism. Certain historians and political scientists credit Lenin for the evolution of the Soviet political system after his death. Others, such as Leonard Schapiro, argue that the system itself, from 1921, evolved an inner-party democratic system to a monolithic one in 1921, with the establishment of the Control Commission, the ban on factions and the ability given to the Central Committee to expel members they deemed unqualified. These rules were implemented to strengthen party discipline, however, the party continued under Lenin and the early post-Lenin years to try to establish democratic procedures within the party. For instance, by 1929, leading party members began criticizing the party apparatus, represented by the Secretariat headed by Stalin, of having too much control over personnel decisions. Lenin addressed such posing questions in 1923, in his articles "How We Should Reorganize the Workers' and Peasants' Inspectorate" and "Better Fewer But Better". In these, Lenin wrote of his plan to turn the combined meetings of the Central Committee and the Control Commission into the party's "parliament". The combined meetings of these two would hold the Politburo responsible, while at the same time guard the Politburo from factionalism. Admitting that organizational barriers may be inadequate to safeguard the party from one-man dictatorship, Lenin recognized the importance of individuals. His testament tried to solve this crisis by reducing both Stalin's and Leon Trotsky's powers. While some of his contemporaries accused Lenin of creating a one-man dictatorship within the party, Lenin countered, stating that he, like any other, could only implement policies by persuading the party. This happened on several occasions, such as in 1917 when he threatened to leave the party if the party did not go along with the October Revolution, or persuading the party to sign the Treaty of Brest-Litovsk, or the introduction of the New Economic Policy (NEP). Lenin, a noted factionalist before the Bolshevik seizure of power, supported the promotion of people he had previously clashed with on important issues to the Politburo; Trotsky and Lenin had had several years of violent polemics between them, while Grigori Zinoviev and Lev Kamenev both opposed the Central Committee resolution which initiated the October Revolution. From 1917 to the mid-1920s, congresses were held annually, the Central Committee was convened at least once a month and the Politburo met once a week. With Joseph Stalin's consolidation of power, the frequency of formal meetings declined. By the mid-1930s, the Central Committee began meeting only once a month, and the Politburo convened at most once every third week. The Politburo was established, and worked within the framework of democratic centralism (that is a system in which higher bodies are responsible to lower bodies and where every member is subordinate to party decisions). The nature of democratic centralism had changed by 1929, and the freedom of expression which had been previously tolerated within the party, was replaced with monolithic unity. The main reason being Stalin's defeat of the opposition; the Left Opposition, the Right Opposition etc. It is generally believed that under Stalin the Politburo's powers were reduced vis-a-vis Stalin. Stalin defeated the Left Opposition led by Trotsky by allying himself with the rightists within the Politburo; Nikolai Bukharin, Aleksey Rykov and Mikhail Tomsky. After defeating the Left Opposition, Stalin began attacking the rightists (referred to as the Right Opposition) through his supporters in the Politburo, the Central Committee and the Control Commission. Stalin and his companion supported an undemocratic interpretation of Lenin's What Is to Be Done?. Throughout the late-1920s, Politburo member Lazar Kaganovich (a Stalin ally), wrote and campaigned for a party organisational by-law which reduced inner-party democracy in favour of hierarchy and centralism. With the defeat of the other factions, these interpretations became party law. To strengthen the system of centralised decision-making, Stalin strengthened the Politburo by appointing his allies to high standing offices outside the Politburo; for instance, Molotov succeeded Rykov as Chairman of the Council of People's Commissars in 1930, to reduce the chance of another independent locus of centralised power coming into form which could threaten him and the Politburo, Secretariat and the Orgburo. During this period, the office of General Secretary became paramount. The Politburo, which was nominally responsible to the Central Committee and the party Congress, became responsible to the General Secretary. The General Secretary, the formal head of the Secretariat and the Orgburo, "came to exercise enormous weight in decision-making." The Secretariat and Orgburo were responsible for personnel appointments in the whole party, and so were used as a machine by Stalin and his allies to promote likeminded individuals. Vyacheslav Molotov and Kaganovich played a key role in strengthening the role of the Secretariat and the Orgburo in party affairs. The 17th Politburo was elected at the 1st Plenary Session of the 17th Central Committee, in the aftermath of the 17th Congress. Outwardly, the Politburo remained united, but on 4 February Grigory Ordzhonikidze, the People's Commissar for Heavy Industry, refused to acknowledge Stalin's projected economic growth targets, claiming that the majority in the Politburo supported his position. Sergey Kirov, who had turned down an offer to take Stalin's place as General Secretary before the 17th Congress, opposed many of Stalin's repressive policies, and tried throughout 1934 to moderate them. Several scholars have viewed Ordzhonikidze's and Kirov's outspokenness as the rise of a moderate Stalinist faction with the party. On 1 December 1934, Kirov was shot dead – whether he was the victim of a madman or killed on Stalin's orders remains unknown. Not long after, on 21 January 1935, Valerian Kuybyshev died of natural causes, and a month later, Anastas Mikoyan and Vlas Chubar were elected Politburo full members. Andrei Zhdanov, the First Secretary of the Leningrad City Committee and member of the Secretariat, and Robert Eikhe, the First Secretary of the Siberian and West-Siberian District Committee, were elected Politburo candidate members. 1936 signaled the beginning of the Great Purge, a nationwide purge of what Stalin deemed as anti-socialist elements. The first victims of the purge were members and leaders of economic organizations. Not everyone in the Politburo agreed with the purges, or the scope of them. Ordzhonikidze ridiculed the purge, and tried to save officials working in the People's Commissariat for Heavy Industry. Stalin expected that Ordzhonikidze would support the purges, at least officially, but instead he wrote a speech condemning them. On 18 February 1937, Ordzhonikidze was found dead in his house, having killed himself. At the Central Committee plenum in February 1937, Stalin, Molotov, Zhdanov and Nikolai Yezhov began accusing leading officials of anti-socialist behavior, but they met opposition. Pavel Postyshev, a Politburo candidate member and First Secretary of the Ukrainian Communist Branch, in response to them accusing a member of the Ukrainian Central Committee of being anti-socialist said; "I don't believe it." When Yezhov proposed killing Bukharin and Rykov, Postyshev along with Stanislav Kosior and Grigory Petrovsky, opposed such a measure, proposing instead of handing them over to the courts. Molotov and Kliment Voroshilov, supported a compromise brokered by Stalin, which handed over Bukharin and Rykov to the NKVD. Despite this opposition, Stalin and his closet associates began purging officials nationwide. In May 1937, Jānis Rudzutaks became the first Politburo member to be purged. In 1938, four other Politburo members were purged; Chubar, who personally telephoned Stalin crying trying to assure his innocence, Kosior, who confessed for anti-socialist crimes after his daughter was raped in front of him, Postyshev and Eikhe. Petrovsky in contrast, was rather lucky, instead of being purged he was not reelected to the Politburo at the 18th Congress. The purging of Rudzutaks, Eikhe and Kosior testified to Stalin's growing power; the Politburo were not even notified of the decision. Postyshev was purged because "of too much zeal in persecuting people." Gorbachev Government took charge in 1985, but ended just 6 years later. The Politburo was the highest organ of the party when the party Congress and the Central Committee were not in session. The Politburo, along with the Secretariat and the Organizational Bureau (Orgburo) until 1952, was one of three permanent bodies of the party. The General Secretary, the party leader, served as ex officio chairman of the Politburo (however, no formal rule stipulated such activity). 28 politburos were elected throughout the existence of communist rule. While nominally subordinate to the Central Committee and the Party Congress, in practice the Politburo was the true center of power in the CPSU, and its decisions de facto had the force of law. Arkady Shevchenko, like many Soviet technical experts, once attended the part of a Politburo meeting that touched on his area of expertise, and he often prepared his boss Andrei Gromyko for meetings. He described the working style of the Politburo's weekly meeting during the Brezhnev era as "quiet, orderly, and methodical. Although an agenda is prepared, there is no quorum call or other form of parliamentary procedure." Shevchenko's memoir makes it clear that the tense political struggle that could often occur among Politburo members usually did not take place openly during its meetings, but rather behind the backs of one's rivals. In practice, Soviet Leninism's democratic centralism often followed a style of unanimous consent rather than majority vote. This style of consensus decision-making had roots not only in the era of the Great Terror, when no one dared demur openly, but also in Brezhnev's carefully cultivated culture of collective decision-making. Shevchenko said, "While the Politburo considered the item for which I was responsible, I sat with Kuznetsov, Kornienko, and [Vasily] Makarov, behind Gromyko at the long table in the Kremlin. Brezhnev asked whether all members of the Politburo had received the draft U.S.-Soviet documents in time and if they had studied them. Most of the members nodded silent assent. 'Can I assume that the draft is approved?' Brezhnev asked. No one spoke. 'The draft is approved,' said Brezhnev after a few more moments of silence. Makarov put his hand on my shoulder, whispering, 'Okay, Arkady, that's it. You can go.'" To be elected to the Politburo, a member had to serve on the Central Committee. The Central Committee formally elected the Politburo in the aftermath of a party Congress. Members of the Central Committee were given a predetermined list of candidates for the Politburo (having only one candidate for each seat), for this reason the election of the Politburo was usually passed unanimously. The more power the CPSU General Secretary had, the stronger the chance was that the Politburo membership were passed without serious dissent. Article 25 of the party Charter, said little to nothing on the actual relationship between the Politburo and the Central Committee. Until 1961, Article 25 stated (with several changes) that the Central Committee "forms" or "organizes" the Politburo. 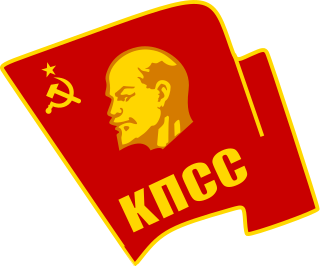 It was not until 1961, under Nikita Khrushchev, that the party Charter was amended; stating that the Politburo was appointed through "secret elections". The amended party Charter stated that at least one-third of the Politburo (as well as the Central Committee) had to step down at each election to the Politburo, and that no members could be elected for more than three-terms. The initiator of these changes, Khrushchev, the CPSU General Secretary, had served in the Politburo for 22 years. Instead of stepping down, Khrushchev made a rule which stated that members "who enjoyed great authority and possessed exceptional ability" could serve more than three terms, if they received more 75 percent approval votes from the Central Committee, upon elections. These amendments were removed from the party Charter under Leonid Brezhnev, and Article 25 now stated; "In the election of all party organs, from the primary party organization to the Central Committee of the CPSU, the principle of systematic replacement of personnel and the continuity of leadership is to be observed." The Brezhnev period saw, in complete contrast to Khrushchev's amendment, the greatest continuity in the Politburo in its history. Article 25 of the Charter remained unchanged under the successive leadership of Yuri Andropov, Konstantin Chernenko and Mikhail Gorbachev. Between 1919 and 1990, 42 members who served as candidate members were not promoted to full member status of the Politburo. Similarly, 32 full members of the Politburo never served as candidate members. Six members who had served as full members were demoted to candidate status during the Politburo's existence. Serving in the Politburo was a part-time function, and members served concurrently in either the party, state, trade union, security or military administrations (or all of them concurrently). Until the 1950s, the majority of members served in state positions, but this changed at the 20th Congress (held in 1956), when 47% percent of Politburo members served in the central party apparatus while another 47% served in the state administration. From the 20th Congress until the 28th Congress, the share of Politburo members serving in the central party apparatus increased, while those serving in the state administration declined. The majority of Politburo members had leading central posts; the highest share of republican officials serving in the Politburo came at the 22nd Congress (held in 1961), when 50 percent of members held offices at the republican-level. Security officials had historically had a low-profile on the Politburo. From 1953 until 1973, no officials representing the security sector served in the Politburo as full members; the last two being Lavrentiy Beria and Nikolay Ignatov. This tradition was put to an end with the elevation of Yuri Andropov, the KGB Chairman, to full membership (having served as a candidate member since 1967). Alexander Shelepin had served as KGB Chairman, but was elected to the Politburo through his work in the Komsomol, while Eduard Shevardnadze, who had served as the Georgian Minister of Internal Affairs until 1972, became a candidate member of the Politburo through his work as First Secretary of the Georgian Communist Party. Similarly in 1973, the Minister of Defense Andrei Grechko was appointed to the Politburo. However, unlike the security sector, the military sector had had representatives in the Politburo since the 8th Politburo (in 1919). Defense ministers who had served in the Politburo are Leon Trotsky, Mikhail Frunze, Kliment Voroshilov, Nikolai Bulganin, Georgy Zhukov and Dmitry Ustinov among others. Similarly, several leading Politburo officials had participated in either the Russian Revolution, the Russian Civil War or World War II. Ethnic Slavs dominated the Politburo from its establishment in 1919. This isn't surprising, since the three most populous republics within the Soviet Union were ethnic Slavic; Byelorussia, Ukraine and Russia. From 1919 until 1991, 89 members of the Politburo were Russians (which makes up 68 percent). In distant second were Ukrainians, who had 11 members in the Politburo, making up 8 percent. In third place are both ethnic Jews and Georgians, who had 4 members respectively. In general, in the first half of the Politburo's existence, there was a higher ethnic representation than the second half. It was not until the 28th Politburo that every republic had a representative at the Politburo. The Politburo never tried to fix the ethnic imbalance within the Politburo. Instead, the Soviet Union at the central level was mostly ruled by Russians. Despite the ideological rhetoric about equality between the sexes, the Politburo came to be composed largely of men. Only four women ever served in the Politburo; Elena Stasova, Yekaterina Furtseva, Alexandra Biryukova and Galina Semenova. Furtseva, Biryukova and Semenova reached the Politburo under the leadership of reformist party leaders; Nikita Khrushchev and Mikhail Gorbachev. The average age of the Politburo was 39 in 1919, and the Politburo continued to age more-or-less consistently until 1985. The reason for this being that the Central Committee treated Politburo replenishment as the responsibility of the Politburo itself. Politburo members usually picked successors who were around the same age, the end result being the establishment of the gerontocracy of the Brezhnev Era. While the age steadily crept up during Khrushchev's leadership, members were replaced; for instance, 70 percent of the members elected to the Politburo in 1956 lost their seats in 1961. In contrast, all the Politburo members elected in 1966 were reelected in 1971. Even more worrisome, 12 out of 19 members elected in 1966 were reelected in 1981. By the time of Brezhnev's death in 1982, the median age of the politburo was 70. This age development was finally put to a halt under Gorbachev. From 1985 onwards, the age of Politburo members steadily declined. Fifty-nine percent of Politburo members (both candidate and full) were of rural origins, while 41 percent were urban. The first members of the Politburo were predominantly from urban areas. For instance, on the 9th Politburo, two out of eight (Trotsky and Mikhail Kalinin) were born in rural areas. From the 1930s onwards, the majority of Politburo members had a father who worked either as a peasant or as a worker. This is strange, considering that one would assume a rise in representation of the intelligentsia as the Soviet Union became more advanced. From 1960s onwards the majority of new members had workers background, as expected. What is strange, however, is that from 1975 to 1981, a sudden increase of people of peasant background took place. When looking at first profession, the majority of members had worked as workers, but the majority of them had attended higher education later in their life (the majority of them choosing engineering). 43 percent of Politburo members attained higher education credentials during their life, while in a close second place, 32 percent of members earned an education in technical engineering. ^ "Сенатский дворец - место работы президента и вручения наград". Putidorogi-nn.ru. Retrieved 27 January 2018. ^ "ГЛАВНЫЙ КОРПУС КРЕМЛЯ". The VVM Library. Retrieved 27 January 2018. ^ a b "Politburo". Encyclopædia Britannica. Encyclopædia Britannica Inc. 2014. Retrieved 4 November 2014. ^ a b c Rees 2004, p. 3. ^ a b c Rees 2004, p. 4. ^ a b c d e f g Rees 2004, p. 5. ^ Rees 2004, p. 6. ^ a b c Wheatcroft 2004, p. 85. ^ a b c Rees 2004, p. 2. ^ Rees 2004, pp. 6–7. ^ a b c d e f g h i Rees 2004, p. 7. ^ Rees 2004, p. 8. ^ a b Lowenhardt, van Ree & Ozinga 1992, p. 30. ^ Lowenhardt, van Ree & Ozinga 1992, pp. 30–31. ^ a b c d Lowenhardt, van Ree & Ozinga 1992, p. 31. ^ a b c d e f g h i j Lowenhardt, van Ree & Ozinga 1992, p. 32. ^ a b c d e f Lowenhardt, van Ree & Ozinga 1992, p. 33. ^ a b c Lowenhardt, van Ree & Ozinga 1992, p. 85. ^ Lowenhardt, van Ree & Ozinga 1992, pp. 85–87. ^ a b c Shevchenko 1985, pp. 207–208. ^ a b c d e f g h i j Lowenhardt, van Ree & Ozinga 1992, p. 87. ^ Lowenhardt, van Ree & Ozinga 1992, pp. 87–88. ^ a b Lowenhardt, van Ree & Ozinga 1992, p. 88. ^ a b Lowenhardt, van Ree & Ozinga 1992, p. 140. ^ Lowenhardt, van Ree & Ozinga 1992, p. 141. ^ Lowenhardt, van Ree & Ozinga 1992, p. 152. ^ Lowenhardt, van Ree & Ozinga 1992, p. 153. ^ Lowenhardt, van Ree & Ozinga 1992, p. 154. ^ a b c d e f g h Lowenhardt, van Ree & Ozinga 1992, p. 155. ^ Lowenhardt, van Ree & Ozinga 1992, pp. 155–156. ^ a b c d e Lowenhardt, van Ree & Ozinga 1992, p. 136. ^ Lowenhardt, van Ree & Ozinga 1992, p. 139. ^ Lowenhardt, van Ree & Ozinga 1992, p. 167. ^ Lowenhardt, van Ree & Ozinga 1992, pp. 139–140. ^ Lowenhardt, van Ree & Ozinga 1992, p. 128. ^ Lowenhardt, van Ree & Ozinga 1992, pp. 129 & 161. ^ a b c d e Lowenhardt, van Ree & Ozinga 1992, p. 129. ^ a b c d Lowenhardt, van Ree & Ozinga 1992, p. 131. ^ Lowenhardt, van Ree & Ozinga 1992, p. 143. ^ a b Lowenhardt, van Ree & Ozinga 1992, p. 145. ^ a b c d e Lowenhardt, van Ree & Ozinga 1992, p. 147. ^ Lowenhardt, van Ree & Ozinga 1992, p. 149. Lowenhardt, John; van Ree, Erik; Ozinga, James (1992). The Rise and Fall of the Soviet Politburo. St Martin's Press. ISBN 0312047843. Rees, E.A., ed. (2004). "Introduction" (PDF). The Nature of Stalin's Dictatorship: The Politburo, 1924–1953. Routledge. pp. 1–18. ISBN 1403904014. Shevchenko, Arkady (1985). Breaking with Moscow. ISBN 978-0394520551. OCLC 11680691. Wheatcroft, Stephen G. (2004). "From Team-Stalin to Degenerate Tyranny" (PDF). In Rees, E.A. (ed.). The Nature of Stalin's Dictatorship: The Politburo, 1924–1953. Routledge. pp. 79–107. ISBN 1403904014. Brown, Archie (1996). The Gorbachev Factor. Oxford University Press. ISBN 0192880527. Bialer, Seweryn (2001). Stalin's Successors: Leadership, Stability, and Change in the Soviet Union. Cambridge University Press. ISBN 0521289068. Leadership of the CPSU Full list of members and candidate members of the Politburo includes dates on the body and year of death (or execution). A politburo or political bureau is the executive committee for communist parties. Andrey Andreyevich Andreyev was a Soviet Communist politician who rose to power during the rule of Joseph Stalin, joining the Politburo as a candidate member in 1926 and as a full member in 1932. Andreyev also headed the powerful Central Control Commission of the Communist Party of the Soviet Union from 1930 to 1931 and then again from 1939 until 1952. The ideology of the Communist Party of the Soviet Union (CPSU) was Marxism–Leninism, an ideology of a centralised, planned economy and a vanguardist one-party state, which was the dictatorship of the proletariat. The Soviet Union's ideological commitment to achieving communism included the development socialism in one country and peaceful coexistence with capitalist countries while engaging in anti-imperialism to defend the international proletariat, combat capitalism and promote the goals of communism. The state ideology of the Soviet Union—and thus Marxism–Leninism—derived and developed from the theories, policies and political praxis of Lenin and Stalin. Alexander Nikolaevich Poskrebyshev was a Soviet politician and a state and Communist Party functionary. A member of the Communist Party since March 1917, he was chief of the special department of the Central Committee of the Communist Party. Grigory Yevseyevich Zinoviev, born Hirsch Apfelbaum, known also under the name Ovsei-Gershon Aronovich Radomyslsky, was a Bolshevik revolutionary and a Soviet Communist politician. Lev Borisovich Kamenev was a Bolshevik revolutionary and a prominent Soviet politician. He was one of the seven members of the first Politburo, founded in 1917 to manage the Bolshevik Revolution: Lenin, Zinoviev, Kamenev, Trotsky, Stalin, Sokolnikov and Bubnov. Alexei Ivanovich Rykov was a Russian Bolshevik revolutionary and a Soviet politician most prominent as Premier of Russia and the Soviet Union from 1924 to 1929 and 1924 to 1930 respectively. The Orgburo, also known as the Organisational Bureau, of the Central Committee of the Communist Party of the Soviet Union existed from 1919 to 1952, until it was abolished at the 19th Congress of the Communist Party and its functions were transferred to the enlarged Secretariat. The Central Committee (CC) composition was elected by the 16th Congress, and sat from 13 July 1930 until 10 February 1934. Its 1st Plenary Session renewed the composition of the Politburo, Secretariat and the Orgburo of the All-Union Communist Party (Bolsheviks). The 16th Congress was the first party convention since the 13th Congress which saw no organized opposition, and the first congress in party history in which there was no opposition to the party leadership. Ukrainian historian Oleg Khlevniuk considers the period 1930–1934 to be a "transitional period" between collective leadership and Joseph Stalin's personal dictatorship (autocracy). The removal of Alexei Rykov, the Chairman of the Council of People's Commissars, from the Politburo at the 1st Joint Plenary Session of the CC and the Central Control Commission (CCC) has been marked in historic literature as "the definitive Stalinization of that body [Politburo]" according to Khlevniuk. The Central Committee (CC) composition was elected at the 17th Congress, and sat from 10 February 1934 until 22 March 1939. Its 1st Plenary Session renewed the composition of the Politburo, Secretariat and the Orgburo of the All-Union Communist Party (Bolsheviks). The 17th Congress was labelled the "Congress of Victors" to mark the success of the first five-year plan and the collectivization of agriculture. The CC 1st Plenary Session elected Joseph Stalin General Secretary of the Central Committee, and Lazar Kaganovich continued to serve as Stalin's deputy, an informal post referred to by Sovietologists as Second Secretary, and was empowered to manage party business and sign Politburo resolutions when Stalin was away from Moscow.